In case you didn't notice—or spend most of the day scrolling through your own Instagram feed from the past three months like I did—tomorrow is the actual, official first day of fall. FALL. Fittingly, it has been hovering around a crisp 66 degrees here in New York City, and today I set out to walk the neighborhood and run some errands in a sweater. Yes, an actual, long-sleeved, knit-and-cozy sweater. My taste in layers tends to fluctuate from year to year—sometimes I want a stiff and structured blazer, sometimes I want a loose, flowing kimono. 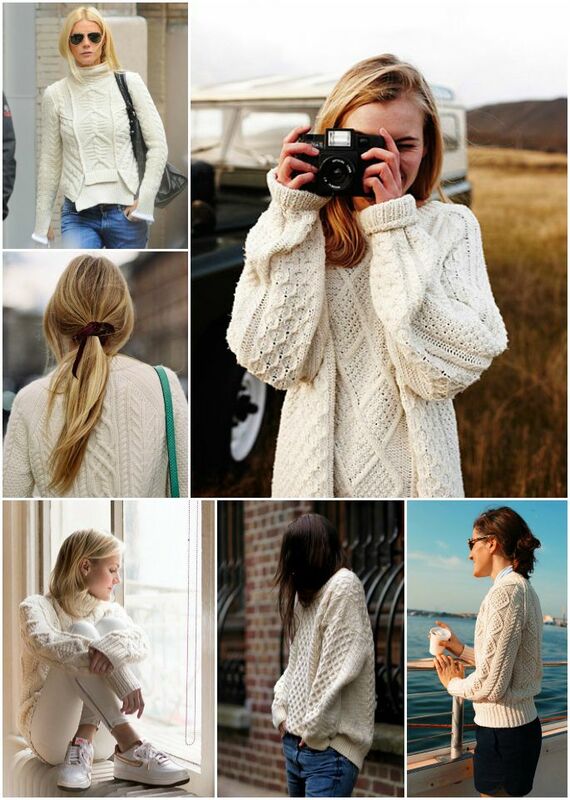 However, my go-to sweaters have almost always been about the three C's: crewneck, cable knit and cream. The coziest and coolest iteration of this is the classic fisherman sweater. Originating in Ireland and meant to be worn by actual fishermen when they were out to sea, these thick wool sweaters are timeless and warm. Many brands have started reworking this traditional design into updated and more feminine silhouettes, like Tory Burch and FRAME. Fringe details, shirt-tail hems, turtlenecks... There's a little something for everyone. Personally, I'm excited to pair one with distressed black skinny jeans and heeled black booties for a sleek-meets-casual everyday outfit. I'd like to add that I often gravitate towards men's styles when it comes to slouchy sweaters, so I've included a few of those below as well. And don't forget you can go super traditional/classic and pick up an authentic fisherman sweater from Aran sweater-makers in Ireland or, you know, LL Bean.